Holiday Shopping at Home Depot! 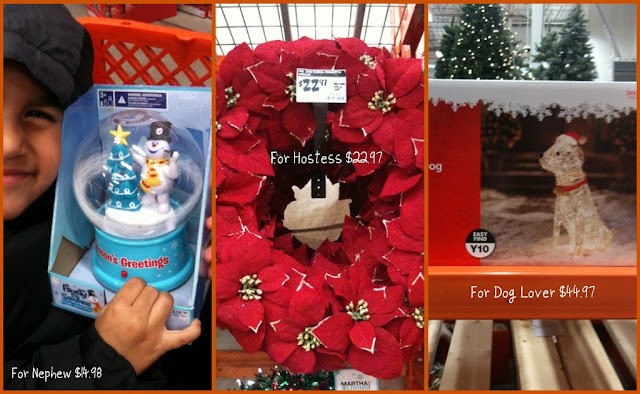 Recently, we did some of our Christmas shopping at Home Depot. Set out for teacher gifts, we found some other great ideas for loved ones on our list! First off, kids love Christmas! And this snow globe was so loved by my own, that I may have to sneak back and grab them one. They had good old Christmas characters, like Frosty and Rudolph, but also Disney's Cars and Charlie Brown! $15 and it's plastic, makes for a great gift for any kid on your list! We picked up 2 as cousin gifts! Next, beautiful wreaths for the hostess of your family's Christmas gathering would be sweet gesture. And for any dog lover, my mama especially, we picked up this indoor/outdoor decoration, hoping it will be a great surprise! She was in love with it at the store! And for the teachers, I found some great items that would work for co-workers as well. Door hangers, fresh pointsettias, blinged out pointsettias, and this super cool tote - good for crafts supplies or tools! And for those hard working uncles, brothers, dads and husbands... a tool set (for the new homeowner), Gorilla Grip gloves (as a stocking stuffer), super heavy duty gloves (for those that may not splurge) or another of these super cool Husky totes (for one that may need some tool organization). Home Depot defiantly crossed out lots of people on our list! 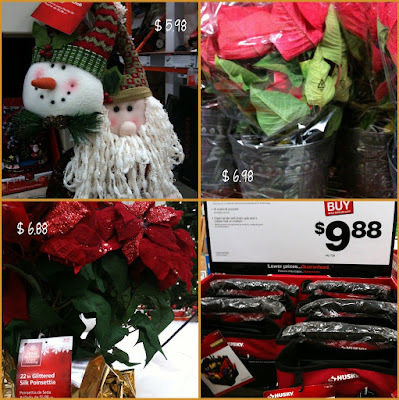 There were so many other things to choose from and lots of Christmas decor, indoor and outdoor for the Christmas decorating fanatics, and a Martha Stewart line of holiday decorations. They also sell gift cards to other retail stores and restaurants...you could literally do all your shopping in one place, and pick up a fresh Christmas tree while you are there! I have a $50 gift card to Home Depot to giveaway! All you have to do is...visit www.homedepot.com/holiday and comment on this post with something you learned at the site. ***Don't forget to visit Home Depot on Facebook, follow on Twitter and there's even an iPhone app that you can browse, shop from and pick up at your store! Hope you enjoy! Giveway will close on Monday, December 12, 2011 11:59 CST. ***Disclosure - This is part of a compensated campaign with Latina Mom Bloggers and The Home Depot. 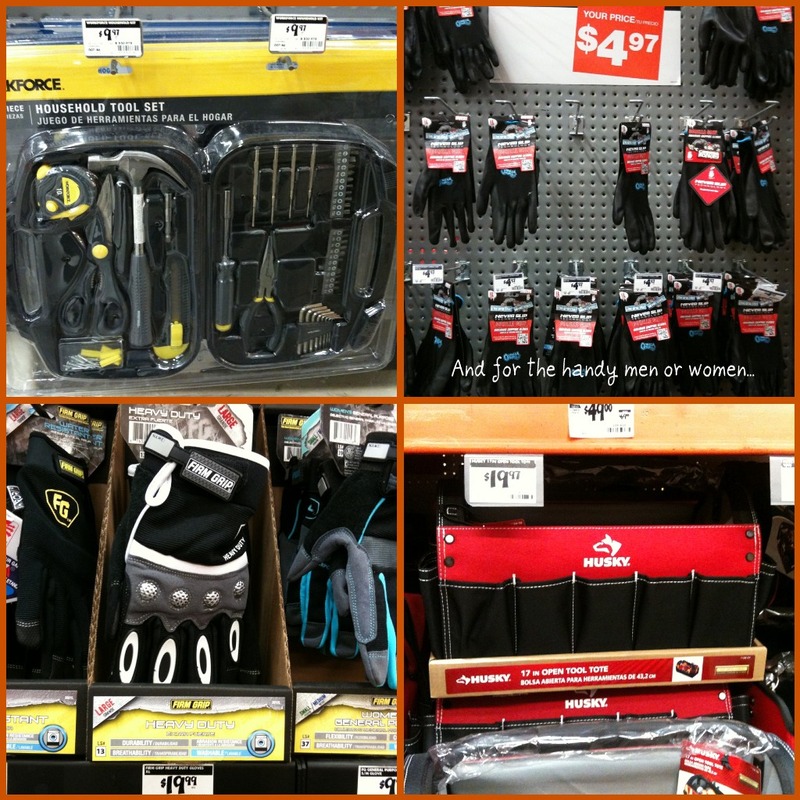 The Home Depot works with bloggers such as myself to conduct product reviews. They do not tell bloggers what to say about their products or how to say it. The Home Depot fundamentally believes that people should be free to form their own opinions and share them in their own words. 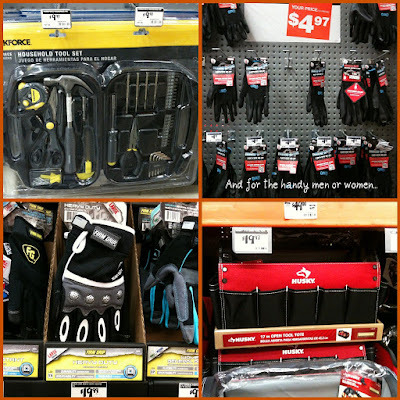 The Home Depot often provides product - free of charge - to bloggers for review as they did for this post. The Home Depot's policies align with WOMMA Ethics Code, FTC guidelines and social media engagement recommendations. The Home Depot provided me with a gift card to shop for the holidays and post my experience. All opinions expressed in this article are my own and not influenced in any way by anyone. ha ha! I was going to comment on that ornament window frame too! Genius. I didn't know Martha Stewart had stuff at Home Depot. You can use solar LED lights! Who knew?! OH, I love the window frame ornament decoration. It would add just a special touch to traditional holiday decorations! I love the idea of solar LED Christmas lights. Had no idea. Invisible tree is a very cool decoration! I too need to get the puppy outdoor decoration as well as that super cute snow globe. I learned how to make a holiday ornament frame and I'm totally going to do this! I LOVE IT!! I learned about solar LED lights. They'd probably work great here in Vegas!